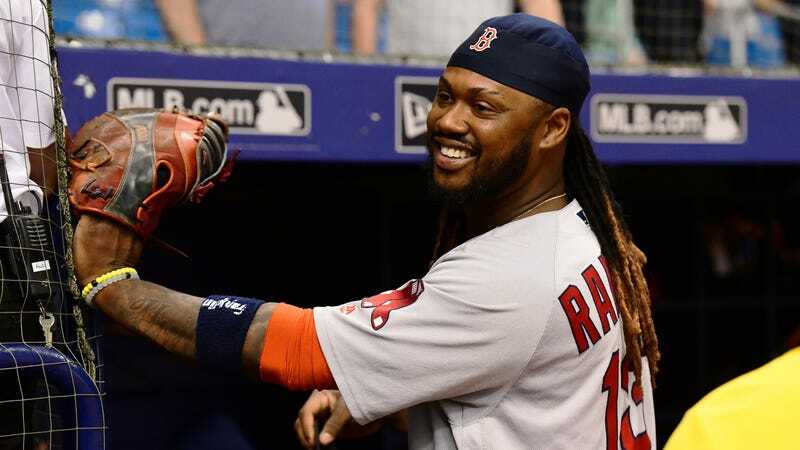 After reports on Friday stated that former Red Sox infielder and current free agent Hanley Ramirez was “being eyed in connection with an ongoing federal and state investigation” that involved distribution of the opioid fentanyl, a new report from the Boston Globe says that Ramirez is not being linked to any drug ring. Ramirez’s name only came up with the investigation because a so-called friend tried to pin a box in his car with two kilograms of fentanyl on Ramirez when he was stopped by police. The man consented to a search of his Jeep, but when the trooper asked to open a brown cardboard box found in the rear cargo area, the man declined, saying it belonged to Ramirez. The man claimed that the box contained books, and that Ramirez’s mother “had shipped the box to him in New York to hand-deliver to his friend [Ramirez] in Boston,” according to the affidavit. In an attempt to back up his story, the man called Ramirez via FaceTime on his cell phone, then handed it to the trooper. The trooper asked Ramirez if he was aware that his friend was en route to visit him and was delivering a box from his mother. Ramirez said he “was not aware,” according to the affidavit. The trooper asked if he could open the box and Ramirez agreed. The box contained a gift bag, with two kilograms of fentanyl inside, the affidavit says. The man’s attorney told the Globe that his client’s “use of Mr. Ramirez’s name was an ill-thought-out attempt to evade further police scrutiny.” Both Ramirez and the Red Sox, who released him on June 1, claimed on Friday to have had no prior knowledge of any allegations.